Change is scary. Change is scary, but so necessary in order to evolve and be better. As much as I fear change, it has always been a big part of my life. In the past four years I’ve graduated grad school, changed jobs, started the Westchester Breakfast Club, (which you should all check out! ), started this blog, and bought a condo. Four years ago I made a new friend and running buddy. Four years later, I am losing my running buddy as she moves away to start her new adventures far away. Losing a running buddy is tough. She is the second one I’m losing (the first moved away too), and it just doesn’t get easier. There is a certain level of trust reached between you and the person you are spending countless pre-dawn hours running with on the road talking about everything and anything in between. It is the kind of trust I don’t just give to anyone. But, she has her own exciting adventures to pursue, so I figured I’d send her off the only way I know how (besides enjoying one last run around Rockies on a beautiful Sunday morning)…with a tiny dinner gathering. I made breakfast for dinner since dinner was on a Monday night, post work, so it had to be something easy. I made French toast from this super awesome cinnamon swirl raisin bread from The Kneaded Bread in Port Chester, eggs, fruit salad (grapes, star fruit, mango, peach, nectarine and blueberries), Peach Cobbler muffins and a cake (white cake with chocolate buttercream frosting…both the muffins and cake were made the day before…since I do have a day job to support this habit). Basically, in one bowl, you mix together all your dry stuff: 1 1/2 cup AP Flour, 1/2 cup sugar, 1/4 cup brown sugar, 1 1/2 teaspoon baking powder, 3/4 teaspoon salt, 1/2 teaspoon ground cinnamon and 1/4 teaspoon ground nutmeg. In another bowl, or a glass measuring cup (which was what I did), all the wet stuff: 1/3 cup of whole milk, 1 large egg, 1 egg yolk, 2 teaspoons of vanilla extract. Whisk that up, then slowly drizzle in 7 tablespoons of butter that was been melted and browned and cooled slightly, while whisking continuously. Then pour the wet into the dry and slowly fold it all together until the flour has all been incorporated. 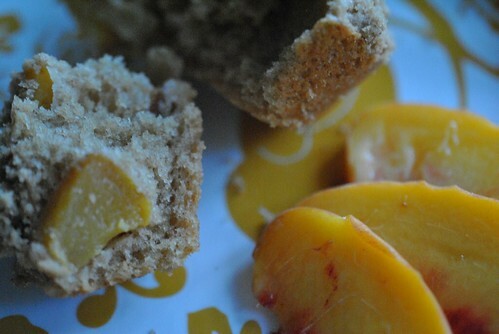 Then gently fold in 1 1/4 diced peaches (about 1 medium peach). 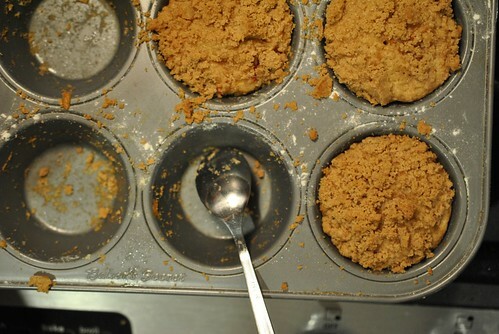 Evenly portion the batter into a 12 cup muffin tin that was been buttered and floured. In a small bowl, combine some more dry stuff: 1/2 cup AP flour, 1/4 cup packed brown sugar, pinch salt, pinch ground nutmeg and 1/4 teaspoon of ground cinnamon. 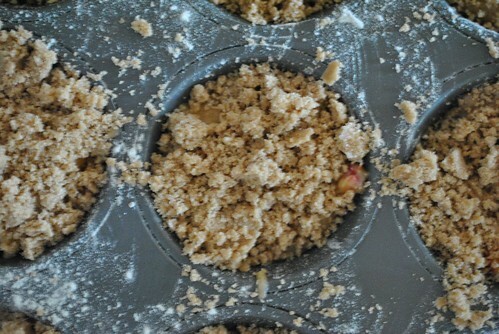 Into the dry stuff, using your fingers, blend in 3 tablespoons of cold butter until the mixture looks crumbly. Portion this evenly over the batter in the muffin tin. Into a 350 degF oven it goes for about 15-18 minutes. 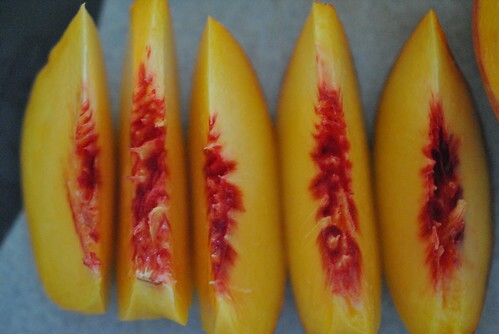 When they are done let them cool for about 20 minutes before prying one out (loosen the edges with a knife) and eating it hot and fresh (the best way). For the White Cake, I followed a recipe out of the Clinton Street Baking Company Cookbook (one of my most favorite restaurants in the LES). 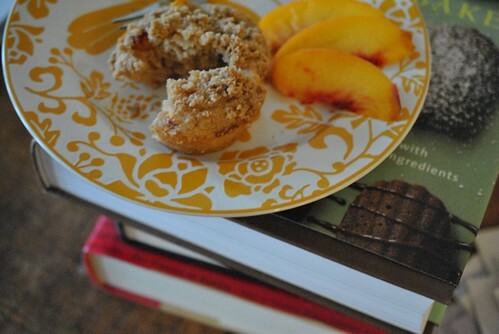 However, they did not edit or test out the recipes in that book. So, I had to dig deep into my baking know how (not much to dig through) and figured something out for the missing piece. First thing first…bring your whole milk (1 cup), 4 egg whites and 12 tablespoons of butter to room temperature. It must be done. In the bowl for your mixer, combine 2 cups plus 1 tablespoon cake flour, 1 1/2 cups sugar, 1 tablespoon plus 1 teaspoon baking powder and 3/4 teaspoon salt. With the paddle attachment, mix together the dry stuff and then slowly add (chunk at a time) the butter while the mixer is on low. then drizzle in about 1/4 cup of milk. Mix until the mixture is clumping up nicely. Then pour in the remaining milk plus 1 teaspoon of vanilla extract and 1 tablespoon of canola oil. Beat until smooth. Pour the batter into another bowl and wash and dry the mixer bowl (unless you have a second one you can use….lucky) and put in the four egg whites. With the whisk attachment, whisk until medium peaks form. Fold in the egg whites into the batter and divide and pour into two cake pans that have been buttered, floured and parchment papered. Bake in a 325 degF oven for about 25 minutes. For the Chocolate Buttercream Frosting, I went back to Joy the Baker and followed her recipe for The Best Chocolate Buttercream Frosting. Except halfway through it, I realized I forgot the container of Ovaltine that I bought for this at my parents house, so this became not the best chocolate buttercream frosting. 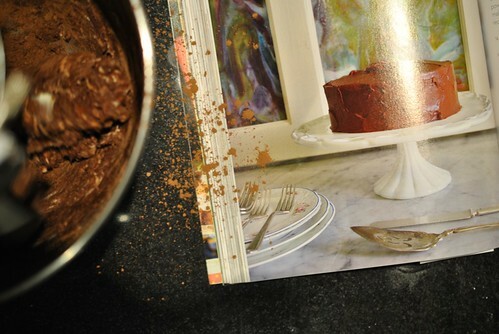 In my mixer bowl, in went 1 1/2 sticks softened butter, 1/2 cup of unsweetened cocoa powder, 1/2 teaspoon of salt. With the paddle attachment, it got creamed. Once that was all creamy, I added about 2 1/2 cups of powdered sugar and turned the mixer back on to low and added 2 tablespoons milk and 1 teaspoon vanilla extract. As that was beating away, at one point I slowly drizzled in some heavy cream to reach the consistency I wanted. Something light, and spreadable. Once I reached it, I put the bowl into the fridge to let it set up a bit before attempting to frost the cake. It helps big time because the buttercream starts to melt and then you just have a huge mess on your hands. Everything came out all kinds of yummy. 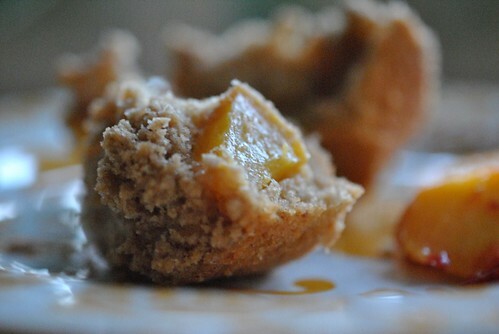 The peach cobbler muffins were another magnificent use of a picked peach from last week. It comes out a bit moist for a muffin, so don’t let them hang out too long in the muffin tin before getting them to a wire rack to cool a bit more properly. I think I ate half a dozen all by myself (over the course of three days…). Assembling the cake was odd. It didn’t feel right, and I thought I used way too much frosting in the middle to make up for the slight doming that happened on the tops (I did top to top so I had the flat bottoms to work with). Then at one point there didn’t seem to be enough frosting to fill in the gaps on the sides and frost the whole cake. And the buttercream was melting and causing a big old mess (especially if you try to hide the messed up sides with almond slices). After frosting, I threw some toothpicks around the top and covered it with some plastic wrap and let it chill out in the fridge. 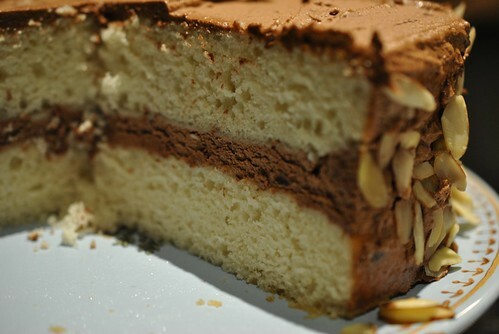 This cake is delicious out of the fridge. Easy to cut and no big crumbs. It turned out to be pretty good. 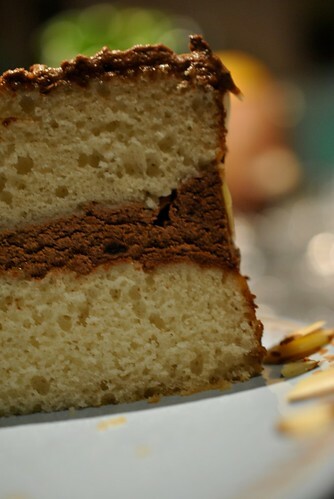 The white cake was a touch denser than I wanted, but was still cake like. The frosting was good. A touch on the sweeter side, but complemented the not so sweet cake well. I’d make it again. Well Claudine, we had a lot of fun. Thank you for listening to be blab for miles on end, for keeping me running when it would have been so much easier to give it all up and sleep till normal people wake up time. But, it’s time for new adventures and new opportunities to be had. I am grateful for the time we had together, and I look forward to hearing all about your life in a place that sees no winter! 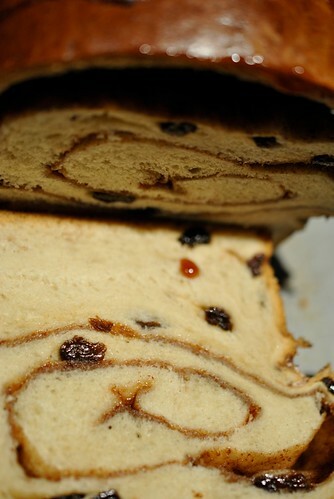 This entry was posted in Bread, Breakfast, Cake, Dessert, Uncategorized and tagged change, chocolate buttercream frosting, cinnamon swirl bread, cobbler, french toast, muffin, Peach, Running, white cake. Bookmark the permalink.